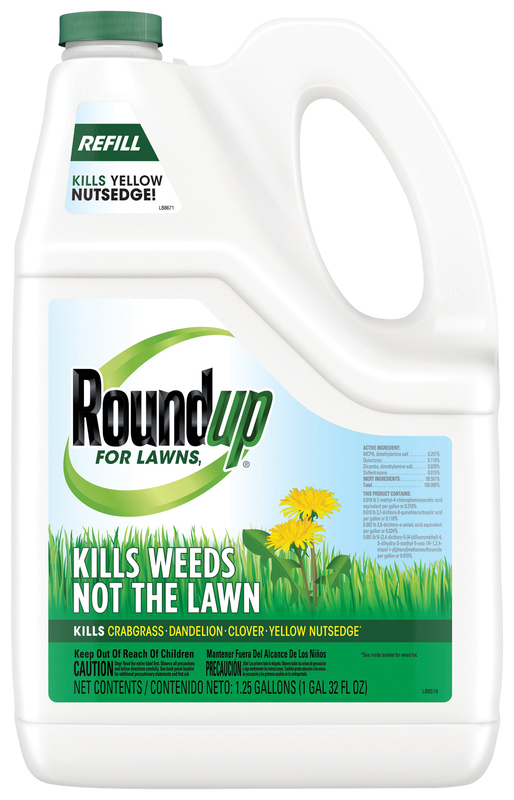 Roundup® For Lawns1 is a formula that kills weeds, not the lawn! It controls over 250 common lawn weeds, roots and all, and is especially effective on hard-to-kill weeds such as crabgrass, dandelion, clover and yellow nutsedge. This ready-to-use refill is easy to pour right into our Extended Wand bottle, with no mixing required, to make it easier than ever to control lawn weeds. This fast acting formula starts killing on contact and kills weeds down to the root so they don't come back. In addition, its rainproof in as little as 3 hours! Roundup® For Lawns 1 is a simple step towards a beautiful, weed free lawn. Up to 1250 sq. ft.
Use this product to refill the empty Roundup® for Lawns1 container by pouring product carefully and directly into the container. DO NOT add water.